Posted by Derek Hughes on 30th September 2018. 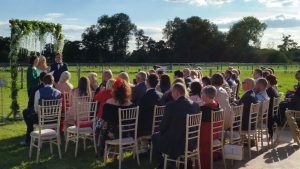 Last Friday day/night we worked locally for a lovely couple called Sarah and Matt whose wedding was taking place in a tipi near Northwich, Cheshire. 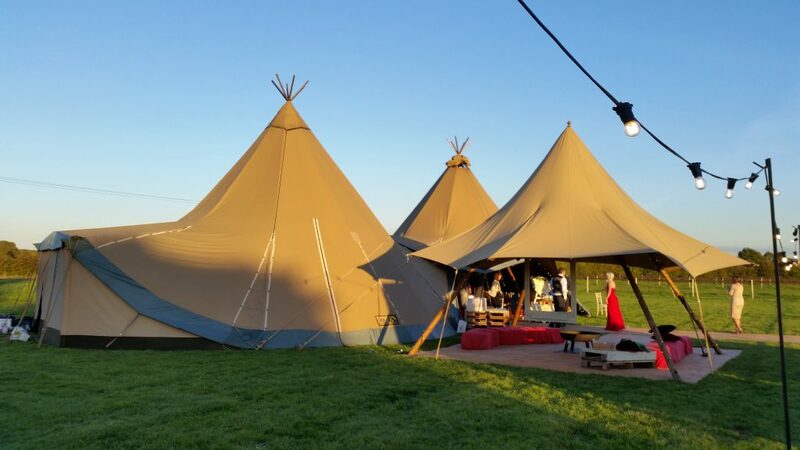 It was actually two tipi’s joined together, with a roaring fire in the centre and lots of fairy lights which looked spectacular and created a great atmosphere. We set up at the back of the tipi next to a live indie band, who were great and sang all night long! We arrived at 11:45 and began setting up the bar which took around 2 hours. In the day there was a team of 3 including my wife Jackie and James who worked hard in getting the set up just right for the occasion. 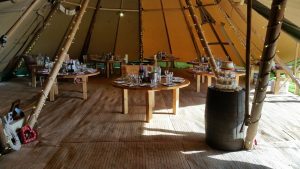 Prosecco and Peroni were the desired welcome drink which was handed out on entry to the tipi following the wedding ceremony. We also provided the whole package on the day. Bottles of red/white wine and water on the tables and the Toast drink too! There were a lot of thirsty guests due to the sunny weather and they were all keen to start the celebrations. All the guests kept us busy during the late afternoon and most of the night. The mad rush came after everyone had eaten, as you’d expect, and the drinks were certainly rolling out! The most popular cocktails were; Strawberry Mojito’s, Bellini’s and Krakatoa. Prior to Sarah and Matt booking us, they requested for ‘Jim Beam’ whisky to be available which was a favourite amongst the guests and in fact we opened a second bottle! The Pinkberryade non-alcoholic cocktail was also a popular choice! 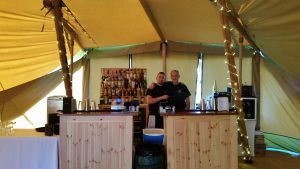 I was supported on the night by my son Thomas, barmen of 15 years – James and newbie Sean who picked up the skills really well. We love being at such special days and feel honoured to be there. All in all the day went very well and was very successful! We are looking forward to the next event now on Saturday, where we are doing a cocktail demonstration for a hen party. What is your favourite “go to” cocktail drink at this autumn time of year? Inside the tipi with the wine and water bottles on the tables.